Researchers at the University of Connecticut, the University of Maryland, and Rice University have won a $7.5 million grant via an Air Force Office of Scientific Research (AFOSR) MURI to address the topic “Security Theory for Nano-Scale Devices.” Ten researchers across the three institutions will collaborate to analyze and upgrade security protections for nano-scale computer hardware. Their goal is to develop Universal Security Theory for the evaluation and design of nano-scale devices. Nano-scale devices, many thousands of times smaller than the width of a human hair, are increasingly implemented by the electronics industry to perform vital functions supporting national security, commerce, energy, and transportation. Nano-scale chips are used in a wide variety of applications from air traffic control computers to medical devices to personal cell phones and the nation’s electric grid and banking system. 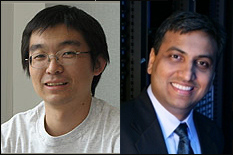 Clark School Professors Ankur Srivastava and Gang Qu, who work within the Department of Electrical and Computer Engineering and the Institute for Systems Research, will both participate in the MURI project. Their contributions to the research will leverage their past work and expertise in hardware security, digital watermarking and fingerprinting for VLSI design, circuit and design obfuscation, design and implementation of physical unclonable functions, 3-D integrated circuit integration and manufacture-aware design. The research aims to address these gaps in the fundamental knowledge base by developing a universal security theory for evaluation and design of nano-scale devices and for development of innovative security primitives. The researchers’ ultimate goal is to provide a comprehensive system of first principles on which to base design, evaluation, and prediction of security performance of existing and next generation nano-devices. “Our collaborative team is motivated by the opportunity to introduce best practices and a new co-design approach for embedding security into nano-devices,” says Srivastava. The highly competitive, five-year multidisciplinary grant was awarded by the Air Force Office of Scientific Research. The objective of this transformative research at the University of Maryland is to develop a universal security theory to extract unique security features, predict the security properties and vulnerabilities of the next generation of nano-devices, design new nano-devices with security at the forefront and evaluate the viability of those devices. The University of Maryland’s Cybersecurity Center, Institute for Systems Research, and Electrical and Computer Engineering Department will be the epi-centers for research at UMD. State-of-the-art equipment contained within Maryland’s Embedded Systems and Hardware Security Lab and Wireless Sensors Laboratory will allow researchers to study the security vulnerabilities of current system designs and develop new methodologies for building nano-scale devices. The primary investigator is Professor Mark Tehranipoor of the University of Connecticut. UConn’s CHASE will serve as the lead research lab while the Nanoelectronics Laboratory and Nanofabrication Facility will support the work at UConn. Also participating from UConn is University of Maryland alumnus and Northrop Grumman Fellow Domenic Forte, who was advised by Professor Srivastava and is now an Assistant Professor at UConn. Rice University’s Adaptive Computing and Embedded Systems Laboratory led by Professor Farinaz Koushanfar will focus on the development of innovative low-power, high performance multi-core processors and advanced security components.